I don't believe that this band needs an introduction or historical lessons. 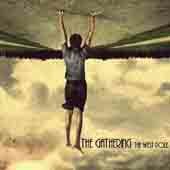 THE GATHERING are back with a new lineup -as we all know- and a new full length album The West Pole; which comes three years after Home. After the band from Netherlands split ways with Anneke Van Giersbergen, they started searching for a new female vocalist. Anneke left the band two years ago in order to explore new music destinations. So, she formed AGUA DE ANNIQUE and the rest of THE GATHERING started releasing statements that their new album would be a guitar oriented one, so we assumed that they'll make a turn to their old sound that we all loved, not that I didn't enjoy their four last albums. With Silje Wergeland from Norway behind the microphone, they recorded their new work, The West Pole. But does the ending result lives up to our expectations? The answer is: No! First of all, and since we talked about the vocals in the album, THE GATHERING did not follow the solution to find a copy of Anneke as a replacement. Even though, in some parts Silje voice sounds like the one of her predecessor, someone will notice that she is a mezzo soprano and Anneke is a light lyrical soprano. She has a beautiful voice and probably she was a good choice for a replacement. As for the music itself, well it may be mostly guitar oriented but that doesn't mean it also sounds heavy. The sound continues the journey that their last four albums begun. So, forget the Metal forms of the past. It's more likely an alternative rock album. Easy to listen to but it didn't impress me much. I surely waited more from a band with that kind of history. I really didn't like at all for example, Constant Run, a song that may remind you of the more alternative NIGHTWISH parts.